The Mediterranean is full of varied and diverse cuisines, but the one thing they all share is a basic reliance on bread. From Italian focaccia and French brioche to Lebanese tabouneh (sourdough pita) and Egyptian fiteer (flatbread), bread is the single most important staple in Mediterranean diets, and serves as the foundation for countless other savory dishes. In Savory Baking from the Mediterranean, Anissa Helou presents a collection of classic and favorite recipes that will provide home cooks with a broad overview of Mediterranean savory baking, from countless variations on flatbreads like pita, focaccia, and lavash, to raised breads such as French Bacon Bread, Greek Spinach and Olive Bread, and Italian Nut Bread. In addition, she offers recipes for a wide variety of pies, tarts, and savory pastries, such as calzones, empanadas, pizzas, and spanakopitta. 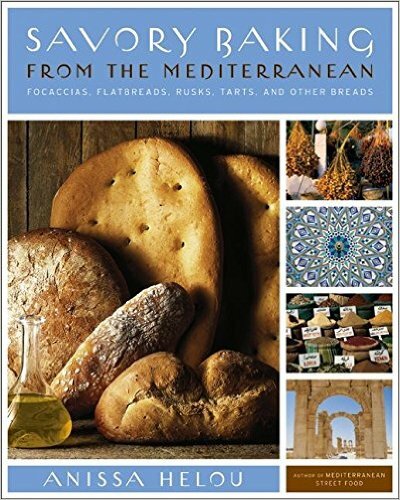 Savory Baking from the Mediterranean is illustrated through out with 100 artful black and while photographs of landscapes, communities, and breads.